We are in the business of welding & fabrication, obviously, on a daily basis, things need to be clamped, jigged, aligned, tacked & welded. As a sole trader, I only have so many hands to do all of this with. So I decided it was time for an upgrade from my old faithful workbench to a fully fabricated weld table. All the available options seemed to come from the USA and importing something so heavy wasn’t an option. So I set aside some time and created my own design inspired by my favourites, with Metric dimensions & a thicker depth. After creating the solid model in CAD, I projected the parts into DXF files to provide to my Laser Profiling vendor. The parts showed up a few days later and I commenced construction. 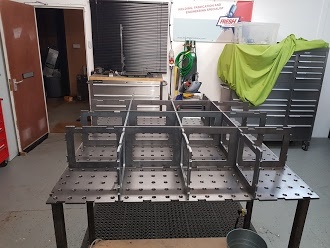 Using plenty of tie rods and U-bolts, I clamped and bumped the components into place to create a highly functional welding/Jig table. I will be creating more parts & fixturing elements as needed. If you don’t have that certain something you need, you can’t find that perfect item or it’s too difficult to source then get in touch today to see how we can provide your ideal solution.